We have all seen autonomous vehicles in the news quite a bit lately. Do they make you nervous? Or are you counting the days until they are deployed? Either way, the effect they will have on our cities and streets will be huge. On one hand, autonomous vehicles may bring new opportunities as a more efficient form of transportation and less people traveling. On the other hand, if everyone has their own autonomous vehicle we may face even worse gridlock. You might also wonder how will cities regulate and plan for these vehicles? How will cities charge for parking? Will their be fees for driving without a passenger? Additionally, industries may welcome some regulation to guarantee there is space for pick up and drop off. Or industry may fight new licensing requirements. 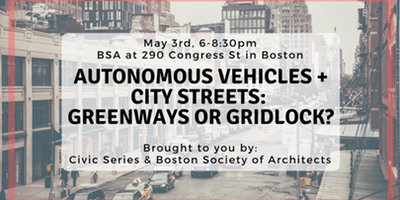 The Boston Society of Architects and Civic Series are joining forces to present the scenarios and choices we will face as consumers and voters with the continued roll out and experimentation of autonomous vehicles in our communities. What do you want to see? What questions do you still have? Join us for an engaging dialogue and debate between our speakers about the future of autonomous vehicles in Boston and beyond, followed by extensive Q&A and discussion.